Whether you’re a fitness junkie or a first-time participant, a good 5K for a great cause just might be the feel-good experience that caps off your most cherished and memorable Branson vacation. Held annually by Tanger’s Outlets in Branson, this challenging and enjoyable 5K course is put on in order to promote family fitness in the community. The course consists of three loops, all with a flat elevation. A new one-mile fun walk has also been added, with gift cards awarded for the best costumes and a silent auction held from 7:00am until 10:00am. Each entry fee is used to benefit the Breast Cancer Foundation of the Ozarks, and the first four hundred participants who sign up will receive an awesome race pack. In the pack, 5K participants will find fun gifts like souvenir t-shirts and more. Places are awarded for first through third in male, female, master’s male, and master’s female categories. Upcoming this year, the Tanger’s Annual Fit for a Cure 5K Run/Walk will be held on October 1st, with check-in time scheduled from 6:00am to 7:30am on race day and the race beginning at 8:00am. You can register now online at http://wwwtangeroutlets.com/race, or with Tanger Shopper Services. If you have a group of eight or more participants, you can receive a special discount, but you must register through Shopper Services. Contact our reservations team to learn more about the Tanger’s Annual Fit for a Cure 5K Run/Walk and other fascinating events, attractions, and activities waiting for you in Branson when you reserve your stay in one of the incredible vacation rental properties that are available through Sunset Nightly Rentals today! Treehouse Condos is a lake-side paradise for anyone in love with the Ozarks! 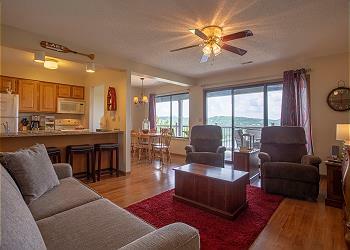 Enjoy the perfect lakeside escape when you rent this adorable 2 bedroom 2 bath condo with amazing views of Table Rock!